Murlough Bay, Co Antrim, Northern Ireland. 30 August 2005. Picture © Bernard Picton, Ulster Museum. 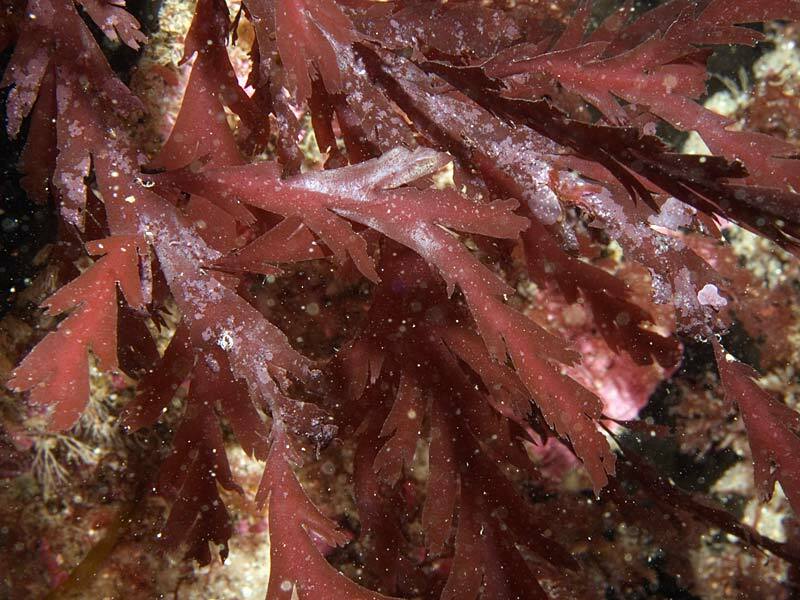 Description: Cartilaginous, strongly compressed, two-edged, deep purplish-red fronds, much branched, to 300 mm long, from hard, conical disc. Branching distichous, irregularly pinnate, branches deeply pinnatifid, segments with large, alternate teeth distally. Midrib visible only near base. Large elongated internal cells surrounded by small, irregular, coloured cells. Habitat: On rocks, lower intertidal pools and subtidal, perennial, a northern species abundant in Scotland, north of England, north and west Ireland south to Achill Island, but uncommon in Donegal, Leitrim, and Sligo. Site © M.D. Guiry 2000 - 2019. Important copyright notice: all text, design and photographs on this site are copyrighted by M.D. Guiry unless otherwise stated and all rights are strictly reserved. Click here for copyright information and contact. Website design: 249 Design Studio. Site maintained by M.D. Guiry (michael.guiry@nuigalway.ie). There have been 8736743 page loads since 1 January 2014 on 25 April 2019.